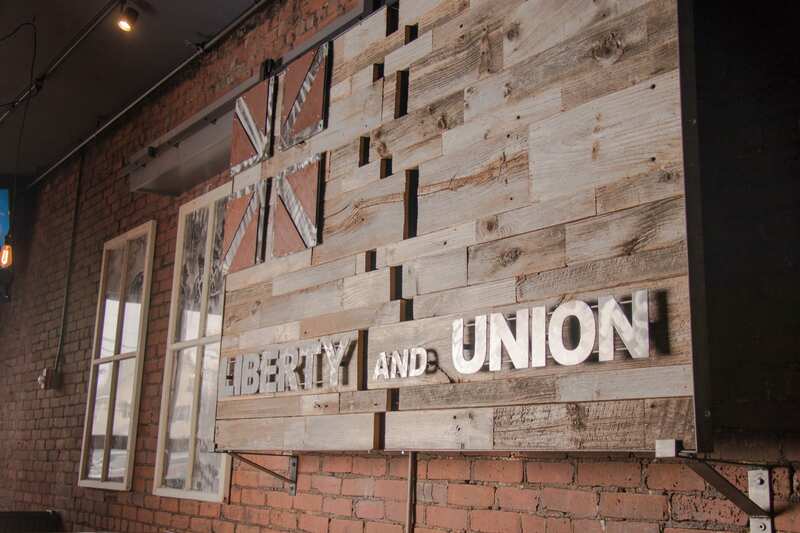 The LIBERTY & UNION ALE HOUSE was established in 2018. The building itself (reminiscent of many a building in the Fenway, or Faneuil Hall area), is consistent with the historic New England brick construction motif. The building also features several styling cues from our local heritage as well. The premises features all natural materials, many of which, are indigenous/unique to Southeastern New England generally, and to Taunton specifically. From the silver themed colors utilized throughout, right down to the furniture and décor, the Liberty and Union Ale House pays homage to our unique history as America's "Silver City." Additionally, the iron and copper based materials employed throughout our restaurant, reference the unique natural deposits of these minerals, which are found, and developed from our local bogs and swamps. The décor also features artwork and images which references Taunton's prominent involvement in the American Revolutionary War. In fact, our logo, "Liberty and Union," was first adopted in October of 1774, after the famed, Sons of Liberty, forced from our City, Loyalists to the Crown. The Liberty and Union Ale House, endearingly dubbed, "The LU", by the local crowd always has something to appease the most fastidious taste buds! With a full selection of appetizers like our famous soft pretzel, the delectable Bacon Wrapped Shrimp or Buffalo Chicken Dip with house made Tortilla Chips. Patrons come from near and far to sample the mouthwatering Olde English Fish-n-Chips and the flavorful array of toppings available on our Pub Flat Breads amidst other scrumptious offerings! With our full bar, you'll find lots of local brews on tap like Boomsauce, Mayflower and Bog Iron, which are on a regular rotation, so you'll always find something fresh to try out! Beyond the beer, relish in our signature Taunton Mule or our other cocktails, wines and coffees.